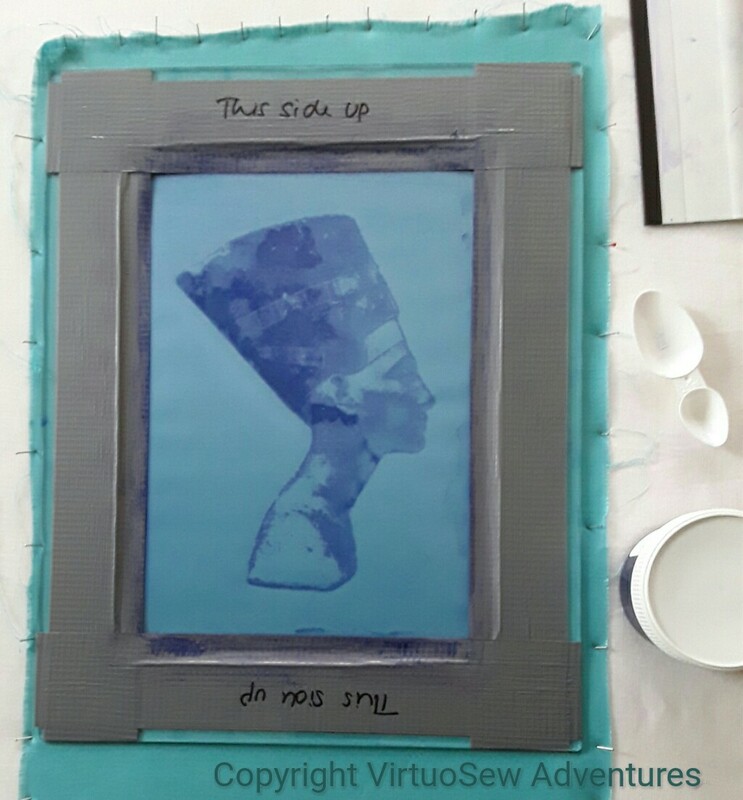 It occurred to me recently that when I finally finish the Dreams of Amarna panels I will probably want to exhibit them somewhere – displaying them at home would require a complete redesign, including moving walls! – and that, however large or intricate they may be, two panels do not an exhibition make. At which point, all the simplicity fell over. I’ve actually done four screen prints on the faience-coloured linen, and about three on sandy coloured linen, and none of them was good enough for my purposes. I’m not sure whether the screen is too detailed for the fabric or whether it is simply my technique that is faulty. So I guess I just need to try harder! 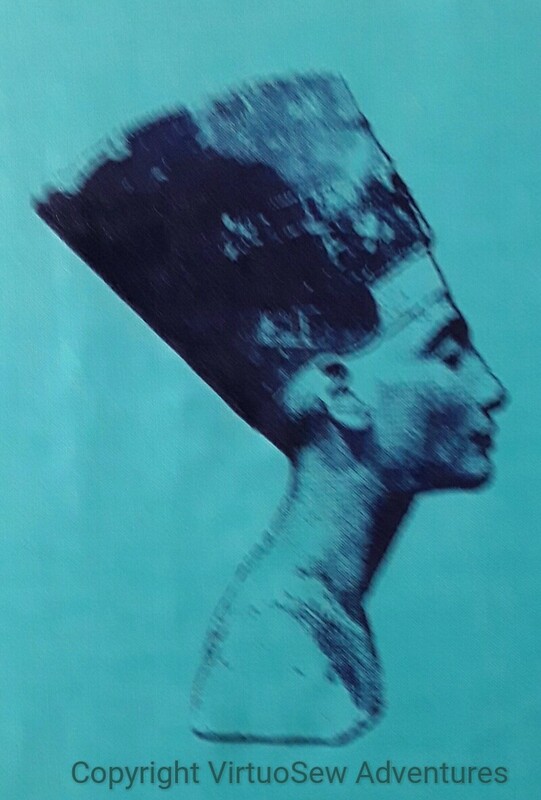 My current plan for the Dreams of Amarna panels is to overlay the embroidered panels with gauze panels screen printed with the heads of Akhenaten and Nefertiti, and since the panels would be hard to store safely and out of the way while I do the embroidery I have always intended to do the screen printing last of all. Then, as I mentioned when I was beginning on the Lotus Fragment, I had a Dreadful Thought. What if the gauze killed all the colour in the embroidery? Would it be possible simply to brighten the colours of the embroidery (which would also involve abandoning nearly everything I have done so far) or would I be able to find a suitable fabric? Obviously some early experimentation would be required… Fortunately, “Creative Stitches and Hobbycrafts” happened shortly after my Thought! I found the stand for Thermofax Screens, and explained what I wanted to do. 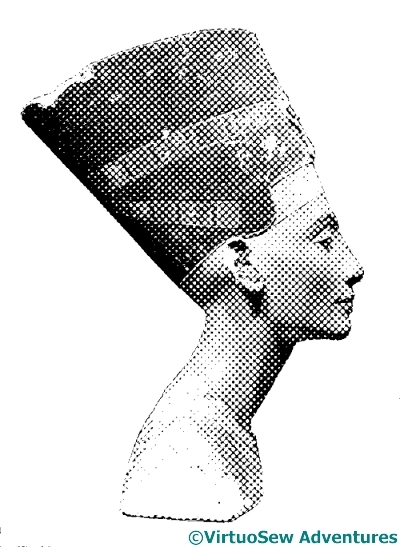 When I explained that the image I intended to print (in the end) would be of the style of an old-style newspaper print, the lady’s face cleared. 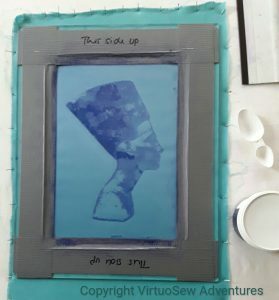 Yes, she said, it would certainly be possible to print onto gauze, and when I eventually get to the appropriate stage, it would be possible for them to prepare screens for me based on images I provided. She also said that I should experiment with fabrics, but that synthetic gauzes were likely to prove more transparent than natural fibres. So I bought a starter kit and a screen that had some of the characteristics I expect my final images to have, and got ready to experiment. 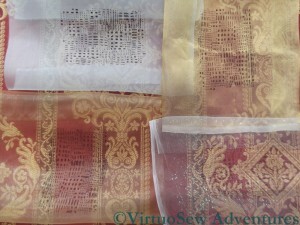 The photo shows, from top left, clockwise: Silk organza, Silk Tissue, Synthetic Diamond Mesh Net, and a Synthetic gauze. I’ve overlaid them over a strongly patterned upholstery fabric, and it’s clear that the bottom two are going to be better bets. 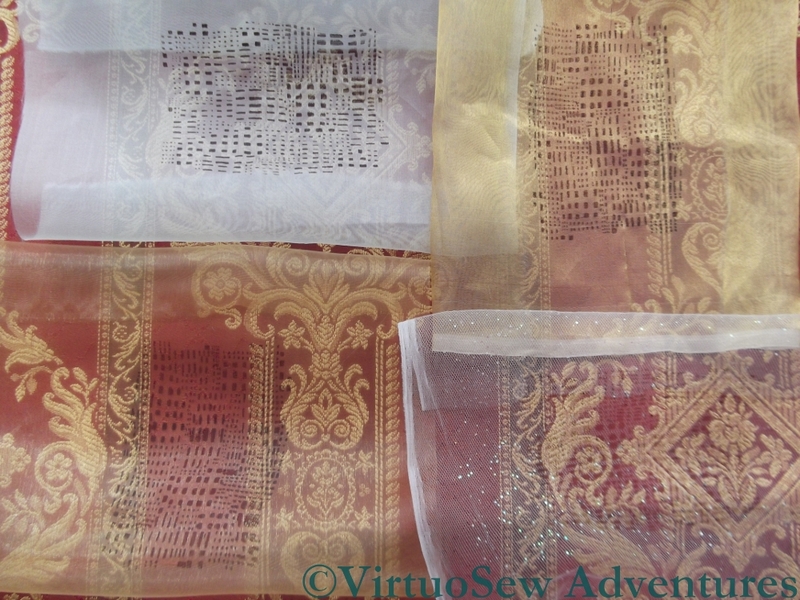 The silk organza all but obliterates the upholstery material, so embroidery is going to stand no chance, and the silk tissue is only slightly more transparent. 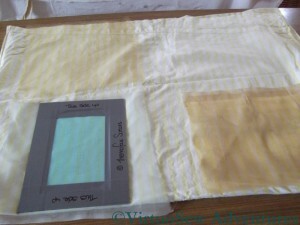 This photo shows the contrast between the heaviest and lightest of the fabrics I have tested. The silk organza took up most of the ink that passed though the screen, and the design shows up clearly, but it reduces the fabric underneath it almost to a pattern of light and dark, with very little colour. 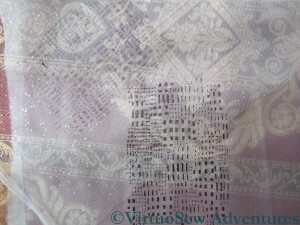 By contrast, the diamond net has to be laid over the organza before the print shows up at all, as you will see if you look at the middle picture at full size. To be absolutely certain, I will need to set up some of the embroidery as I intend to display it, and then hang the gauzes about an inch in front, but as an early indication, I think this gives me enough to go on that I can feel reassured. There are suitable fabrics for my purposes, and basic single colour printing is no harder than I remember from university. I can set my worries aside and continue embroidering – just so long as I bear my ultimate plans in mind!